We live in an era which requires us to be instant in our shopping and simultaneously keep our budget in place, and this has become possible with dynamic websites which cater all the discount deals needed for shopping. 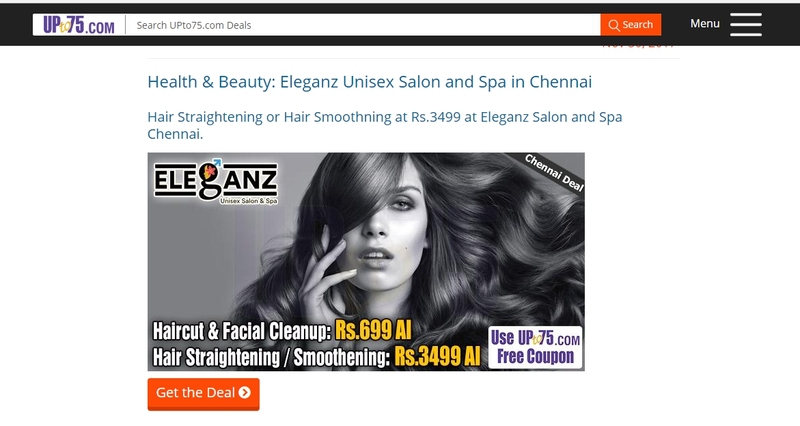 To tackle the pricing levels and to buy at fair prices, a website like UPto75.com has come up to give the customers what they wish at a discount price. Every kind of deals, offers, sales, coupons, discounts are available at Upto75 for the retail buyer which involves Restaurants, Health and Fitness, Clothing, Resorts, Travel, Diagnostics, Electronics , etc. They effectually cover every domain of a person’s lifestyle. The website also has top brands and retailers like KFC, Dominos, Cleartrip, Shoppers Stop, Jawed Habib and Naturals offering the best quality services from their end. Feature that distinguishes UPto75 from other coupon and deals websites are - It is completely user-friendly, regular deal updates and the discounts UP TO 75% They provides free coupons for various cities across India. They have some of the most exciting deals sorted down in their Top 20 and Jaw Dropper section, which makes the hunt for coupons and deals an easy breezy task. These deals are a must catch for residents in Chennai who believe in enjoying comfort at lesser prices, their offers expand to many areas and locations too. Hair straightening and hair smoothing are a trend these days, and everyone wants to get rid of wavy hair, so another discount that comes is at Eleganz Unisex Salon and Spa which provides Beauty Services for hair smoothing and straightening at Rs.3499 in Chennai. Hurry because it ends on 30th Nov 2017. 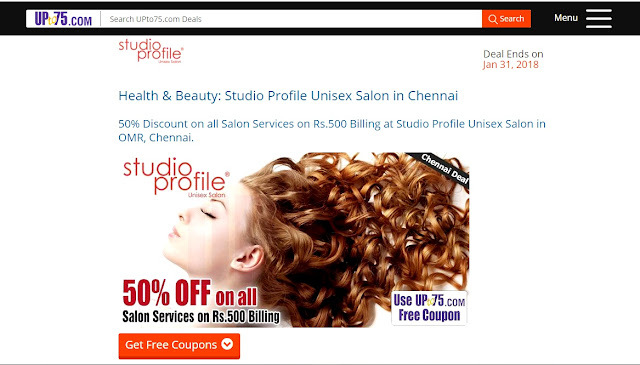 You will get to avail 50% discount on all the services at the salon on the bill of INR 500 at Studio Profile Unisex Salon, OMR in Chennai, the sale would end on the 31st Jan 2018. Overall, the website is easy to navigate, the coupons and deals have been sorted out perfectly according to the categories and city. Hmm, does it have any con? Nothing that I could think of. It is a must try for women on a budget, as well as college students. If you desire to have access to a broad range of exciting categories and products with catchy deals, shoot your attention towards UPto75.com and shop it all! I highly recommend it.